I remember the first Karen Jacob SC Test Kitchen I attended: it was early December sophomore year and freezing out. Thankfully, the recipe that night was gooey, rich chocolate cherry cookies that warmed me right up. This past Wednesday was my last time attending the Test Kitchen (at least as an undergraduate), and while the weather couldn’t have been more different than my first journey there, the food and people were just as warm and welcoming as always. Veggie Tofu Patch Pie. The name alone got both Karen and me excited to make the recipe, and the results did not disappoint. 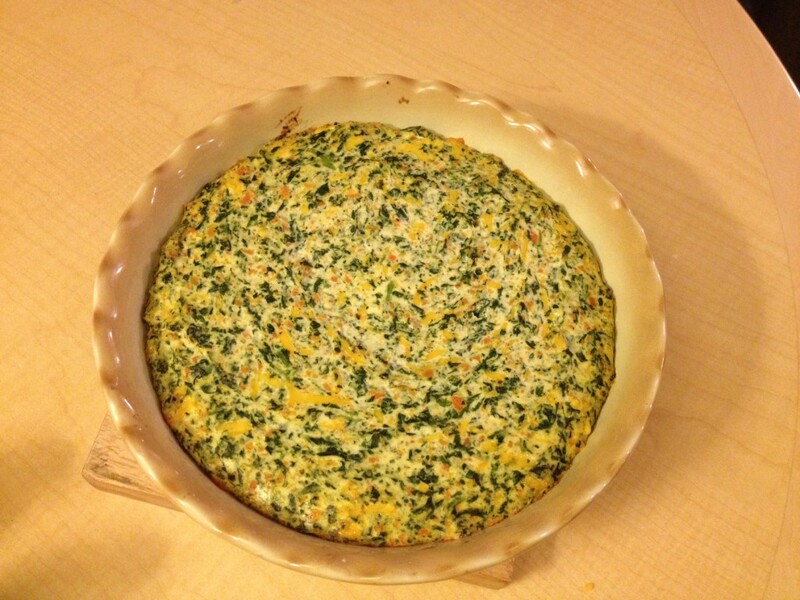 Another crowd pleaser from the Meal Makeover Moms, this pie resembles a crustless quiche and is beautifully speckled with color from the veggies. Now I know the idea of tofu may scare some of you away from trying it, but I promise that if someone made this for you without telling you what is in it, you would not guess that it contains tofu. The pie has a soft, airy texture that is complemented with a little crunch from the veggies. And the taste? Very much like a light quiche. The only change I would make next time is a little more garlic and black pepper. I also like spicy foods, so I would even consider adding in some red pepper flakes. This pie is colorful, silky, healthy, and easy to prepare making it a perfect option for Mother’s Day or celebrating graduation with a brunch. Preheat oven to 350 degrees. Drain the tofu in a colander. Place on a cutting board and cut into four 1-in-thick slices. Pat dry with paper towels to remove excess moisture. Heat oil in large non-stick skilled over medium heat. Add the garlic and cook, stiring frequently until golden for about 30 seconds to 1 minute. 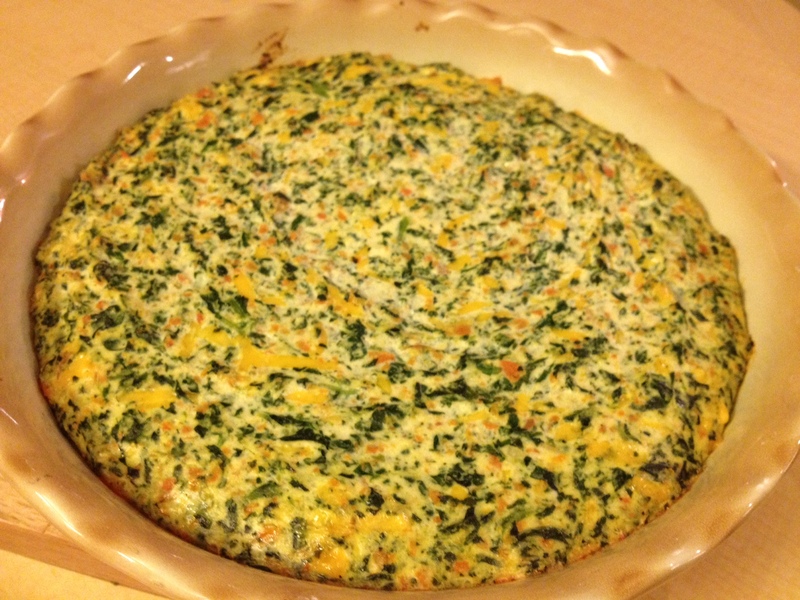 Raise heat to medium-high, add the spinach and carrot, and cook, stirring frequently, until the spinach wilts and the carrot is tender, about 5 minutes. Place on cutting board and coarsely chop. 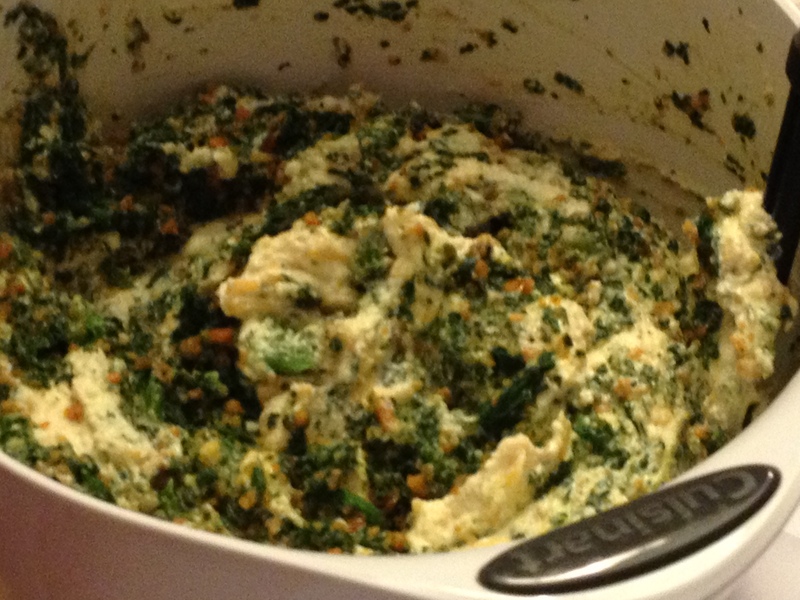 At the test kitchen, instead of chopping we placed them in the food processor. Meanwhile, place the tofu, eggs, Parmesan, salt, and pepper in the bowl of a food processor and process until smooth and creamy. Transfer to a large bowl and stir in the Cheddar cheese and cooked vegetables. I love quiches but I try to avoid dairy because I’m lactose intolerant. thought this might be a good alternative, but saw that there’s still cheese inside. no matter, I’m sure I can find something to replace the cheese in this.